"Diagnoses like a bad cold, acute bronchitis, the flu don't need an antibiotic … you're putting a chemical in your body that has no chance of helping you and can only hurt you." There are very few conditions that require an antibiotic. They should only be used to treat diseases caused by bacteria, and Linder says you should only get an antibiotic for an ear infection, some sinus infections, strep throat and pneumonia. Inappropriate antibiotics are most often prescribed for pharyngitis (sore throat) and sinusitis, but the rates for acute bronchitis are also high. Jeffrey Linder: "About 70 percent of the time, doctors prescribe an antibiotic for acute bronchitis and the right percent is zero." Putting a chemical into your body that you don't need won't help you and can only hurt you, Linder says. Another issue with antibiotics is that the more we use them, the less effective they become. Antibiotic resistance and the development of superbugs (bacteria that do not respond to any antibiotics) are now worldwide threats. Jeffrey Linder: "There's concern that with the continued use of antibiotics and the lack of development of new antibiotics, we're going to be faced with more and more infections that we just can't treat." Linder says the greatest predictor of an inappropriate antibiotic prescription is a doctors' perception that the patient wants an antibiotic, even more so than the patient wanting an antibiotic. Doctors want to keep their patients happy and may think turning them away without a prescription will create unhappiness, Linder says. Jeffrey Linder: "Doctors just assume the patient wants antibiotics without asking explicitly. They think the antibiotic prescription is going to make the patient happier. They think that giving an antibiotic prescription is going to be more efficient for the visit and they don't have to get into explaining the difference between viruses and (bacteria) or erroneously kind of getting into this judgment call of 'Is the prescription I've given my patient worth making antibiotic resistance for the entire community worse?'" Over the past two decades, Linder and a team of scientists have studied interventions or "nudges," most commonly used in behavioral economics, to reduce inappropriate antibiotic prescriptions. These types of nudges take advantage of emotion and social factors around antibiotic prescribing. Two tactics that have worked well use either electronic health records (EHR) or email to nudge doctors. In one study, doctors had to write a separate "antibiotic justification note" in EHRs when writing an antibiotic prescription. In the most effective study, doctors received email alerts with their ratings when it comes to inappropriately prescribing antibiotics. "Top performers" never inappropriately prescribed antibiotics. Jeffrey Linder: "We very carefully tailored that kind of negative feedback to have a little bit of an emotional bite. To tell a bunch of doctors who are used to being top of the class throughout their entire career, you're not a top performer. We were expecting that to be a little controversial." That study yielded significant results. 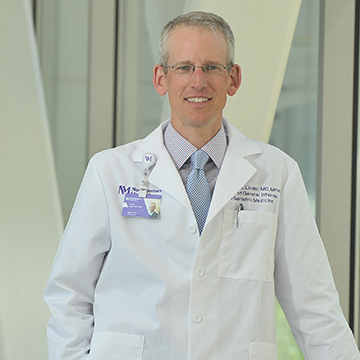 Jeffrey Linder: "We reduced the inappropriate antibiotic prescribing rates in the peer comparison group from about 30 percent at the beginning of the study down to about 6 percent at the end of the study. Most studies drop the percentage prescribing by about 10 percent absolute ... we got significantly lower." Linder is now studying similar tactics to reduce the number of inappropriate opioid prescriptions. He says making it more difficult to renew opioid prescriptions through EHRs could help. Right now it is easy to renew a prescription by pressing a button, he wants to change that default. Jeffrey Linder: "We can change the default. That is the easiest thing we can do to actually reduce the dose or to get this conversation going. We're trying to change the environment a little bit to help that happen." Erin Spain: Welcome to Breakthroughs, a podcast from Northwestern University Feinberg School of Medicine. I'm Erin Spain, executive editor of the Breakthroughs newsletter. Physicians are notorious for prescribing antibiotics to people who don't really need them. This is a costly problem that comes with unnecessary side effects and contributes to the spread of antibiotic resistant superbugs. Today's guest is studying ways to make doctors think twice before writing an antibiotic prescription. Dr Jeffrey Linder is the chief of general internal medicine and geriatrics and the Department of Medicine here at Feinberg. Welcome to the show. Thank you so much for having me. So when should an antibiotic be prescribed? Jeffrey Linder: There's a variety of conditions for which antibiotics should be prescribed in. Most of the work I've done has focused on respiratory infections because that's the collection of diagnoses for which most antibiotics are prescribed and for which most antibiotics or misprescribed and so the only for respiratory diagnoses for which you should get an antibiotic is otitis media or an ear infection, a sinus infection, but actually the minority of sinus infections strep throat and you want to make sure it's strep throat and pneumonia and that's it. And so diagnoses like a bad cold, acute bronchitis, the flu don't need an antibiotic. Erin Spain: Doctors do know this, but yet it seems that they're continuing. If someone comes in with a sore throat or a bad cough or something like that and a patient asks for antibiotics, sometimes they're, they're getting them. Erin Spain: There's huge side effects that come with this. Can you talk about why it is so important that you only have an antibiotic when you need one? Jeffrey Linder: The main reason that I talk to doctors and patients about appropriate antibiotic prescribing is actually the risk to the individual patient. I'm sure we'll get into risks of antibiotic resistance, which is a huge problem to be sure, but for an individual patient, for, for many of the things I mentioned a second ago, like cold, acute bronchitis, the flu, you're putting a chemical in your body that has no chance of helping you and can only hurt you. And so patients ironically, are kind of coming in and requesting something that's not going to help them and could hurt them into. We as doctors are, are kind of enabling that to. Erin Spain: So what are some of the reasons why doctors continue to do this? As you said, they know for the most part, why does it continue happening? Jeffrey Linder: It continues happening for a variety of reasons. The number one reason we hear from doctors about why they prescribe antibiotics that they know medically are probably not necessary is that they say patients want them and they want to keep their patients happy. And that, that spreads out into a variety of other reasons. So you want to keep your patients happy. You want to be able to do something for your patient. People have taken off off in a half day or more of work they've parked. They have come to see you. It's a huge hassle to come there and be told, you know, it's, it's nothing. Yeah. Waited out is it's unsatisfying for everybody. And patients understandably would wonder why I, why did I waste my time coming in and seeing the doctor? Interestingly, the greatest predictor of an inappropriate antibiotic prescription is the doctors' perception that the patient wants an antibiotic even more than the patient wanting an antibiotic. For some reason we are hesitant to ask patients explicitly why they've come in to see us, where you think it'd be the most natural thing in the world. What can I do for you? What, what are you looking to get out of the visit today? Things like that. But there have been studies showing that we don't bring up antibiotics for fear that for some reason it's going to or in some way it's going to precipitate a argument. Erin Spain: Interesting. So, sort of deflecting a possible unhappy situation or scenario, they just the hand, the prescription over. Jeffrey Linder: Right. And so doctors feel like they just assume the patient wants antibiotics without asking explicitly think the antibiotic prescription is going to make the patient happier. Think that giving an antibiotic prescription is going to be more efficient for the visit and they don't have to get into explaining the difference between viruses and or erroneously kind of getting into this judgment call of is the prescription I've given my patient worth making antibiotic resistance for the entire community worse, which as I described a second ago is shouldn't really even enter into the conversation for many of these diagnoses for which antibiotics aren't even indicated. Erin Spain: You actually study how these doctors think and behave. This is one of your main areas of research and you've said before, doctors are people too, like and they're trying to navigate, negotiate what, how they're dealing with their patients, but you are finding ways to intervene. Can you tell me about some of your successful studies and interventions that you've run and what works and what doesn't to to help curb this problem? Jeffrey Linder: Let me start with what doesn't work. We just figured that if we just reminded doctors are educated them, that they would do the right thing or provide the education or a reminder just the right time that they would then do the right thing around antibiotic prescribing and it turns out that doesn't work, as you said a second ago, doctors know they're not supposed to prescribe an antibiotic for a cold or acute bronchitis, and yet they're still doing it. So reminding them of that. I in retrospect, I don't know what, what we're, we're thinking that, why, why we thought that would work. And so keeping in mind that doctors are people and doctoring is an emotional social activity. We have tried to implement some nudges that grow out of behavioral economics to take advantage of, emotion and social factors around antibiotic prescribing. Erin Spain: You've had it at least two different successful studies that you've had some pretty significant results that do work. Tell me about those. Jeffrey Linder: So the two nudges that we studied that seemed to really work, we're a, what we call it, accountable justification. So at the time of an antibiotic prescription, we would ask doctors through the electronic health record, are you prescribing this for a respiratory infection? And if it was for a diagnosis for which an antibiotic is not indicated, we would say that's great, you can go ahead and prescribe an antibiotic, but we just want you to write this little tweet length justification note that's going to go in the chart as an anti, a separate antibiotic justification note, and if you don't write anything, it's going to go into the chart and it's going to say no justification given. And so it's a little bit of a break to get doctors to think about prescribing antibiotics. , but importantly we are making it clear to the prescribers that we're exposing their thinking and their reasoning to their peers. And so we're sort of, we're using a social effect there to influence their prescribing and that had a significant effect in terms of decreasing inappropriate antibiotic prescribing. Erin Spain: One of your studies used some unusual tactics to reach doctors. Can you tell me a little bit about how you came up with the idea of sending these emails? Jeffrey Linder: Letting people know if they were top performers are now, so you're describing are pure comparison intervention and we've had this intervention I'm described as shaming or , you know, making doctors feel bad. But what we did was once a month we gave doctor's feedback about their antibiotic prescribing rate, but we gave the feedback in a very particular way. So the feedback key to their antibiotic prescribing to the top there, top performing peers. So this was a study done in Los Angeles and, and different sets of practices in Boston and once a month the doctors, if they were one of the top performers, they would get an email that says you're a top performer. It says just that, um, if you are not a top performer. And it actually turns out the top performers had an inappropriate antibiotic prescribing rate of zero. So the bar is pretty high. But if you, if you had, if you were not a top performer, you got an email once a month that said you're not a top performer. And we did it that way for a couple reasons. So one, as you alluded to a second ago, we're showing them that their peers, that this can be done so that they know that they have peers in their clinic network who actually have an inappropriate antibiotic prescribing rate of zero. We are keying the feedback on the top performers because what happens when you give people feedback across, say a bell curve at the top. Performers usually backslide a little bit. There's a little bit of a boomerang effect. So if you just gave people feedback and said, you know, your number, your number one out of 100, if I'm number one, I'd say, well, I can just slack off a little bit as opposed to if you're telling me I'm a top performer, I want to stay a top performer. One other aspect of the, the intervention was that the feedback obviously has a little bit of an emotional component to it. So it turns out, the listeners, if you get a home energy report, there's a couple things on that report that have been shown to be effective in changing energy or gas usage. And that's keying off the top performers like we did, but then on your report, I bet there's something like a smiley face or a, you know, a word or a thumbs up or something if you're doing a good job and if you're not, there's a frowny face or a thumbs down or something. It turns out those little cues about that have a little bit of an emotional valence or a little emotional component to it are what we as people being emotional beings, that's what we respond to. Much more than being presented with data and doctors being people to respond the same way. So we very carefully tailored that kind of negative feedback to have a little bit of an emotional bite. So to tell a bunch of doctors who are used to being top of the class throughout their entire career, you're not a top performer. We were expecting that to be a little controversial. Erin Spain: And what was the reaction from the community when that paper came out? Jeffrey Linder: When the paper came out, it was pretty positive because we were, we were able to get the inappropriate antibiotic prescribing rate lower than anybody had ever seen before. So we reduced the inappropriate antibiotic prescribing rates and the peer comparison group from about 30 percent at the, at the beginning of the study down to about six percent at the end of the study. Most studies drop the percentage prescribing by about 10 percent absolute, so say 20, 30 to 20, and we got significantly lower. Interestingly, we followed people after we turned off the intervention for another 12 months. So we, we, we stopped sending the emails, we stopped asking them to do the accountable justification and we did see a little bit of backsliding, but 12 months after we turned the intervention off in the accountable justification group, there was no difference between that group and the control group, but there was still a statistically significantly lower antibiotic prescribing rate in the peer comparison group as compared to a control set of practices. Erin Spain: You noticed this practice of overprescribing antibiotics pretty early on when you were a resident, what did you see and how did that sort of inform and lead you down this path that you're on now? Jeffrey Linder: I got into this mess because of one patient I saw when I was a resident in an urgent care type practice where we were seeing people. This was a practice where patients didn't have a primary care doctor and they would come in for acute problems. And I was seeing a patient who had a cough who was a smoker and um, I'd been reading that we shouldn't prescribe antibiotics for patients with acute bronchitis and maybe we should for patients if they have chronic lung disease, but it was a little unclear to do what to do with healthy smokers. And I went to my preceptor and said, this person has a cough and they're a smoker and they said, well, we should probably just give them an antibiotic because they smoke. And that led me to do a systematic review on the effectiveness of antibiotics for smokers with a cough who don't have underlying lung disease. It turns out it doesn't help and that's kind of how I got into this whole area. Erin Spain: How common is the misconception from patients that antibiotics kill viruses? Jeffrey Linder: So we did a study a few years back looking at data from a national science foundation, annual survey of Americans knowledge and attitudes towards science and technology. And one of the questions on the survey that goes back decades is antibiotics don't kill viruses. Is that true or false? Um, and it's a 50/50 question in between, I think it was about 1980 and 1990, something like 20 to 50 percent of people got it wrong and ever since 1990, about 20 percent of, or excuse me, about 50 percent of people have gotten it right. And so the perception that antibiotics kill viruses is kind of a 50/50 tossup. Other people have done studies after they've been educated about what a virus is and what the bacteria is and how antibiotics work and that antibiotics only kill bacteria and some other investigators have done post teaching interviews with the patients. And I'm sad to say they didn't quite get it. So this is one reason why I discouraged doctors from even getting into the whole issue of a virus or a bacteria and making it much simpler than this. This is a viral illness and this medicine will not help for what you have. Erin Spain: Superbugs are something that's been in the news. It's an actual threat. The CDC has warnings about this. Um, there's some consequences that come about after too many antibiotics are prescribed and they just aren't really working. And tell me a little bit about what happens to this special bacteria that we call superbugs. Jeffrey Linder: A problem with antibiotics is that when we use them, they become less effective. That's just a fact. So whether you use them for an appropriate reason or an inappropriate reason using an antibiotic in gender is more antibiotic resistance. So, so we only really want to use an antibiotic on a population basis when it has the potential to help. So that's, that's kind of job one. Erin Spain: So what is a superbug? Jeffrey Linder: So a superbug it's a bit of a catchphrase, but we just think about this as a bacteria that's resistant to one or more antibiotics and the superbugs lately there, there've been some very scary bacteria that are not sensitive to any antibiotics we have at all and there's concern that there with the continued use of antibiotics and the lack of development of new antibiotics, we're going to be faced with more and more infections that we just can't treat. Erin Spain: I know there's been some calls from the US government that we need to really work on reducing this antibiotic prescription. Tell me a little bit about what's out there right now. What, what are, what's trying to be done on a national level? Jeffrey Linder: Yeah. The Center for Disease Control and prevention has a big effort through state health departments and nationally to encourage appropriate use of antibiotics and discourage a inappropriate use. Um, so, and that's by way of a education, um, publicity events, trying to educate the public a little bit more. Um, and then they've also recommended a implementing some. Another intervention that we found was helpful. This, what we call it, a precommitment poster where doctors or other prescribers commit on a piece of paper to only use antibiotics appropriately. And then we actually in this one study, blew up that commitment into a poster size and had, and this has the prescribers signature on it, has their picture on it, we put it up in the waiting room and it turned out doing that, had a significant, impact on inappropriate antibiotic prescribing. Erin Spain: What sort of message do you have physician to physician about this topic? Jeffrey Linder: So physician to physician. There's a few assumptions. I always go over with our residents, medical students and colleagues that, that you just shouldn't make. So one this, this idea that the patient is there to get an antibiotic. Don't assume that, um, and in fact, asking them explicitly or better yet setting the expectation that you will only prescribe an antibiotic when it's indicated and will not prescribe an antibiotic for a viral illness. Setting that expectation somehow, before the patient even gets to you through your staff, through posters in the waiting room is very, is very useful because that kind of diffuses the concern on the doctor's mind that, oh, this patient is here to get an antibiotic and that's what this visit is all about. I also talked to them about patient satisfaction because they, um, they're very concerned about maintaining patient satisfaction as we should. Um, and but it turns out that patient satisfaction is not that significantly tied to an antibiotic prescription if the patients feel like they've been listened to and you've explained what they have and, and explained a set of contingencies, people are very happy with the visit. Erin Spain: These interventions are pretty novel. And another big problem we have in this country right now is the over prescribing of opioids. Do you think some of these interventions could work in the same way? Um, as they're working for antibiotics? Jeffrey Linder: Absolutely. Um, so we, we actually already are working on a several interventions and studies to try to reduce inappropriate opioid use. Some of the interventions look similar to, similar to some of the things I described for inappropriate antibiotic prescribing, but another nudge that's been shown by other investigators to be very useful is, is defaults. So changing the default the way, say the electronic health record is set up really influences behavior much the same way of, having a default, a organ donation. So if the default is, unless you say otherwise you're, you're an organ donor, not surprisingly, that really increases organ donation rate or retirement planning. You know, most places now have a default retirement plan that you will be enrolled in unless you opt out, unless you actively opt out. Exactly right. And so doctors, we responded defaults similarly. So the easiest thing in most electronic health records right now is to just keep the opioids going. Renew. Okay. And you just keep the opioids going and there's no in a, in a time crunched ambulatory visit, it can be challenging to have a discussion with a patient about how they're doing with the opioids. Most patients who are on higher dose opioids are not doing well and we know more and more that opioids impair people's functioning. Um, it doesn't help with pain, which seems strange, but it's true and there have been more and more studies coming out that as we reduce opioid doses, patients pain actually goes down and their function improves. Um, and so in some way can we change the default so that the easiest thing is to actually reduce the dose or to get this conversation going. So we're trying to change the environment a little bit to help that happen. Erin Spain: So technology plays a big role and a lot of the work that you're doing, the electronic health records are now everywhere, but how to sort of interface with that technology to communicate with physicians is huge. Jeffrey Linder: Absolutely. We, we spend much of our day and you know, if you've seen a doctor recently, we, you'd be right to accuse us that we spend way too much of our day staring at the computer screen instead of staring at the patient. But that's kind of where our work happens. And there's a lot of great things about it, but it does kind of trap us into workflows and a lot of the electronic health record has not been thoughtfully designed. And so we are responding to the way it's designed, thoughtful or not. , and sometimes in negative ways, whether it's making it too easy to order tests to easy door to opioids, too easy to order antibiotics, um, whereas we could redesign things to make it easier to, to a little bit more, do the right thing.